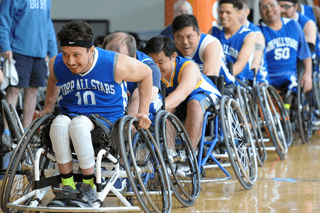 On March 23-24 the BORP All Stars will host the 16th BORP Hoops Classic on Coast Guard Island in Alameda. This is the BORP All Stars 20th year of existence and we continue to grow and introduce new athletes to the sport. In our 20 years, 50+ athletes have suited up for the All Stars and for most of us the opportunity to play ball changed our lives. The BORP Hoops Classic is the jewel in the crown of the NorCal league tournaments and teams from Redding to Fresno are expected to compete. Joining the fun will be the BORP JR. Road Warriors in their final tune-up before Junior Nationals in Chicago the following weekend. ID requirements for visiting Coast Guard Island.